In 1984 David Braben and Ian Bell managed to fit a simulated galaxy into 22 Kilobytes — a computer programming feat that inspired the creation of the first internet newsgroup as well as a generation of programmers. Now, after a successful crowdfunding campaign, Braben is bringing the classic Elite computer simulation1 to a new generation, and this time it simulates what we know about our existing galaxy, with procedural programming techniques based on real-world data filling in what we don’t. Approaching Beagle 2 Landing space station orbiting the Asellus A moon, which orbits the planet Asellus. The station is named after Colin Pillinger and his Beagle 2 spacecraft. Click the image to see a large version. Elite: Dangerous provides a testing platform for future space exploration ideas from engineering to everything else, and a holistic education about the cosmos which the human species are still a living part of, although barely. My first reaction to the Elite: Dangerous title was that it was a bit unfortunate, but after thinking of its portrayal of the immensity of our cosmos as a dangerous idea to the human status-quo of nationalism and organized religion, I now like it (these human themes are also present in the simulation — when we stop fighting over lines on maps here on Earth, we may well begin fighting over them in space). 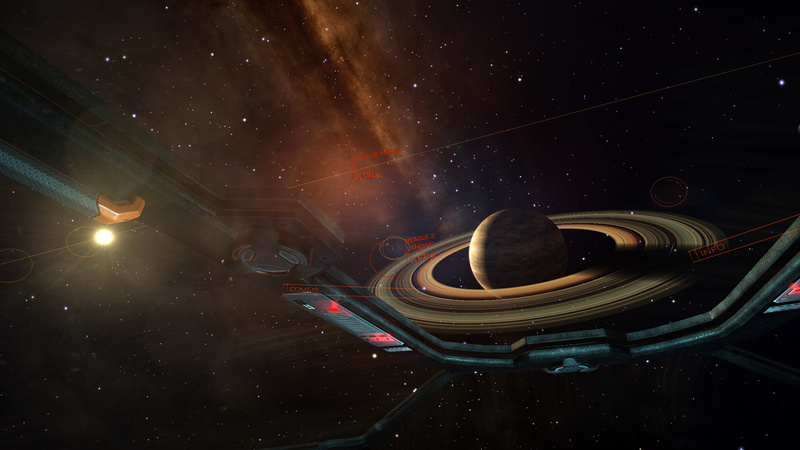 You can also explore this reconstructed galaxy in David Braben’s game. In fact the first and biggest player group in the game will be the First Great Expedition, whose goal is to travel as far into the simulation as possible, mapping and recording their discoveries as they go, as virtual scientific endeavour. The work of Braben and his team at the aptly-named Frontier Developments is art fused with science and engineering in the spirit of the Renaissance, exploring human themes of curiousity, communication and commerce, loneliness, fear and love, through our greatest medium of communication so far. Elite brings me joy because like the internet it shows that humans are capable of creating beauty during and despite of our continuing mass-stupidity. For we are the local embodiment of a Cosmos grown to self-awareness. We have begun to contemplate our origins: starstuff pondering the stars; organized assemblages of ten billion billion billion atoms considering the evolution of atoms; tracing the long journey by which, here at least, consciousness arose. Our loyalties are to the species and the planet. We speak for Earth. Our obligation to survive is owed not just to ourselves but also to that Cosmos, ancient and vast, from which we spring..
An education about our cosmos is needed now, more than ever. Many thanks to David Braben and his team at Frontier for making this, and to all the Kickstarter backers!